I post time management tips all the time, because let’s face it, we all struggle with time. If you want to see them as they release, tune into one of my social channels below. I’ll also update these monthly so you can find them all here. Try one or two and see if they don’t offer a little ease to your weeks. Get something done for you first. Then everything else will feel like a bonus. Every day make a plan for the next day while the workload is still fresh. It’s much harder to come back to in the morning if you don’t know what you are doing next. No is a good way to protect your time. If you aren’t good at saying no, start practicing some phrases you can say that won’t make you feel bad, but still allow you to say no. If we see things as too large to handle, we’ll avoid them altogether. Get your productivity back by breaking those large goals into chunks that you can manage in shorter bits of time. If it’s important, it should get done first while you still have your steam. Sleep is essential to leadership. You think best when your tank is full and even work faster and make better decisions. Ensure you gt your sleep in order to make the most of your awake time. ‘DND’ time is essential for the leader. Sometimes it’s ok to shut the door and refuse calls. Get those big rocks doen with focus! Notifications are just distractions. They can easily pull us off track and rarely are they essential to get to in that second. So shut down all the notifications or put your phone on plane mode. This may seem facetious, but I am being serious. If you know you’ll have to wait until the last minute, at least insure the resources and information you’ll need are in line now. Otherwise you will be chasing people and information down at the last second and creating last minute emergencies. Sometimes we get into a routine of doing things and just think they need to be done. As you go through your day, ask yourself why you are doing what you are doing. If you can’t come up with a good answer, it might be time to stop or hand it over to someone else. 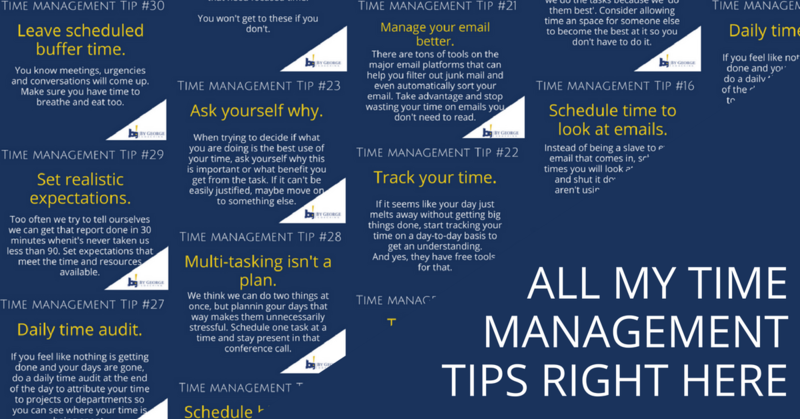 Get the Time Management Guide for Leaders! You can prioritize, plan and achieve with this step-by-step planning guide. Get your to-do list and sit down with this worksheet to plan your best week ever. Create a plan at least. Things will happen and rearrange it, but at least when you get back to your schedule, you’ll be able to pick up again easily. Use your strengths to know when you could delegate or get help on a project. If you are doing things because you have the skill set but could be doing other things that are more valuable, perhaps it’s an opportunity to let someone else become more skilled at it. No one will do things better than you if you don’t give them a chance– and get the bonus of taking some items off your plate. You could work on that same project for months perfecting the details, however at some point you have to balance the importance of the details compared to the time you spend on it compared to other projects. Time limits allow us focus on the priorities and the value we get out of a project. Even if you do a million little things that you can’t batch together, think of the headspace you need for the tasks at hand. Are some tasks more creative than others, or do some need more analytical thinking than others? Group them by the type of thinking they take and it will take less time to transition from one to the other. Leaders delegate. Bill Gates did not get where he is by doing all the jobs. As leaders grow, they have to give up more and more control over the tasks. Consider what tasks can be delegated. Email can be very distracting if you are intending to focus on anything. Close the email window and only check it at specific times. Otherwise, email can run an entire day without anything else achieved. Notifications are a distraction. Even if you don’t click on them, notifications break up our focus and it takes a bit of energy and to get back into the flow. Just shut them off and check your apps or email at scheduled times to ensure you are getting the most of the work day. If you think meetings are a waste of time, you aren’t using meeting time the right way and you are likely wasting a lot of people’s time. Know exactly what you want to get out of a meeting before you show up. Take just a few minutes ahead of time to understand what answers, resources or objectives you want out of the meeting. Your meetings are bound to feel more productive. Inspiration is great, but sometimes it doesn’t come until we start – especially big projects that seem overwhelming. Just start the first step and see if inspiration comes while you work at the action steps. You are not a machine, you need breaks. Take them. It will help rather than hinder your focus. Email takes tons of time from your day. Be as efficient as possible with it by using tools to manage it. Do you track your time? If you don’t how do you know how much time you are spending on different projects and how do you know if you are being profitable? If your time seems to disappear try tracking it for a couple weeks. If you aren’t asking yourself why you are doing the tasks you are doing, you’re probably doing stuff that doesn’t make a profit or a difference somewhere on that list. If you don’t schedule the big dream projects in first, you’ll find that time slips away and we don’t get to them. Make them as important as you know they are an focus on planning them first. A plan will always help you stay on schedule and see the goals for the day. Without focus we can spend a lot of time on low-impact activity. Do you tend to spend too much time on tasks, making them perfect or adding more details than required? Sometimes we don’t have the space for perfection, so set yourself a timer and call it complete when it dings or schedule more time. You could be taking time from more important actions. What projects or clients can you attribute your time to? When we add up the time over a week or a month, we might find we’re spending more time in an area that doesn’t have as much impact for the amount of resources it takes. Audits help you make more profitable choices. I know you think you are getting more accomplished when you multi-task, but I promise you it isn’t as focused or efficient to do so. Schedule yourself enough time for priorities and save the multitasking for non-work activities. Perhaps the most pervasive time trick we plan on ourselves is not giving ourselves enough time to really complete the tasks in the block we’ve scheduled. We run over making other projects late and it’s a plan to overwork or underdeliver. Think about the time it takes to actually do the task well and schedule it. Which leads me to…. Be realistic and give yourself breaks throughout the day in your schedule. You might think packing up every minute will keep you focused, but your brain needs breaks to keep motivated and refreshed. Leave times with nothing scheduled because something will always come up or you can even get a lunch break! The best way to motivate yourself and see how far you’ve come is by reviewing the things you got accomplished. With so much coming in, it’s nice to remind yourself of the progress you’ve made. Get something big out of the way first to build a little momentum. Then everything else is downhill. Perfect is a moving target. Create the requirements before you start the project so you don’t spend a lot of time on things that aren’t important. Whether it’s at the grocery store or on the train, you know there will be times when you have to wait. Consider using that time to connect with people or get some menial things done. Use the other side of your brain when it comes to off-time. Balance helps keep your whole brain healthy. So often we underestimate the impact that exercise on our thinking. Blood flow from movement doesn’t just help our muscles – it pumps and clarifies our brain with new blood and oxygen. We all need that for making clear decisions. The biggest downfall in planning is that we don’t schedule downtime. We try to get in as much as we can forgetting that our human bodies need breaks and energy-gathering time. If not we burn out and blow up the whole calendar with illness or bad decisions. If you are someone who is consistently late, start telling yourself everything is 30 minutes before it is. It will give you time to prep and still be on time. Do you use SMART goals? They are the most effective way I’ve found to stay focused. Where is your effort going? Don’t let email take over your life. You can get lost in there and not get anything on your list done. You are not a hostage. Do you have a mentor? You can get a lot of benefit from talking to those who have been where you are. Clutter on your desk, clutter in your mind. A clean desk helps your brain stay focused. Setting goals always creates more focus. With all the technology in the world, many of our tasks can be automated and taken off our to-do list. What can you automate? Make blocks of time to make your day easier and set realistic expectations. Take a Brain Break. You need it.